The flagship integrated amp in the Unico range, 150 sits above the Primo, Seconda and 90 models. 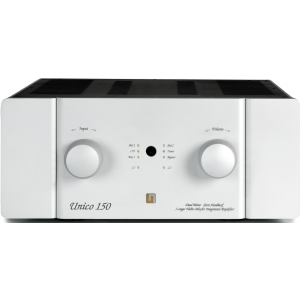 Unison Research Unico 150 Integrated Amplifier takes the flagship position from the well-established Unico 100. Designed and developed in line with specific sonic and scientific criteria set by the design team at Unison Research, the Unico 150 is something truly unrivalled. Created from the most premium components there is no doubt that the Unico 150 will offer enjoyment and musical pleasure for years to come. The Unico 150’s dual mono design gives this amplifier more power and control of your music. Boasting 220W (4Ω) per channel, it is capable of driving some of the most demanding loudspeakers with ease and effortless composure. On the back, there is a wide selection of inputs opening up a world of possibilities. This includes two balanced XLR ports along with standard RCA. There is also 4 + 4 speaker terminals allowing bi-wiring, and a subwoofer output to add even more depth and enjoyment.